Mr. Bholanath Talpade (77) showed us around the house filled with craftwork made by his wife Ina Talpade (75) – patchwork on bedspreads, embroidered sheets and saris, a magazine in which her recipes have been featured and a book with all her published stories. We were there to meet both of them, but somehow each reply of theirs brought her into focus. When we asked them what each of them liked about the other or one change they would like to see in their spouse, they both seemed amused. “Does one ever think of such things,” his expression asked. They seem to have lived their lives taking many such things for granted. Getting along and nurturing each other seems like the very matrix of their existence. As we spoke to them, trying to find loopholes in their seemingly peaceful co-existence, we found our doubts getting quelled and realized that harmony and affinity prevail in good measure. Curious, we researched their community ‘Pathare Prabhu’ and came to know that it is known for its broad outlook and social reforms such as educating the girl child and widow remarriage. Sitting in their sprawling bungalow in Bengaluru, we talked about marital expectations, changing times, notions of equality and understanding, and a lot more. Here are some excerpts of our conversation with them. Jigyasa & Pratibha: Tell us about your roots. He: We are Maharashtrians and belong to the Pathare Prabhu community. Both of us are from Mumbai; born and brought up over there. 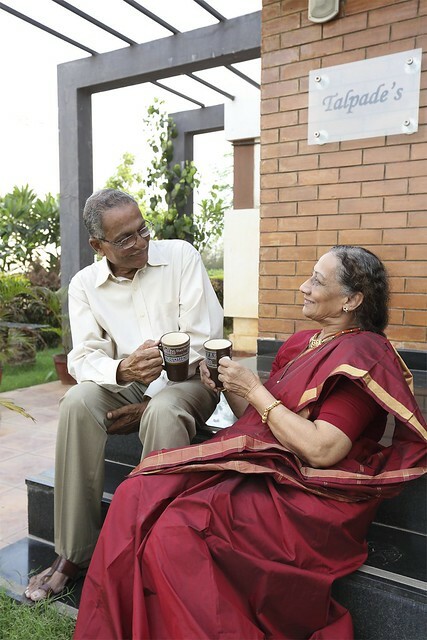 After retirement, we moved cities as our son and daughter-in-law, Vivek and Trupti, live in Bengaluru. She: We are enjoying our life here as we have found some good friends. J&P: What were your fields of work? She: He used to work in State Bank of India, Mumbai. I have worked at the ‘Welfare centre’ (HRD) in Air India. He: After retirement, she taught at various workshops in schools during summer vacations. J&P: Ina-ji, we have heard that you always keep busy? Do you have many hobbies? She: Oh yes, stitching, knitting, crochet and such other craftwork; I enjoy all these things. I have also been a writer and dramatist. He: Her short stories have been published in Lalit Sahitya, a Maharashtrian magazine. The first page carries a full page write-up about her. Here is a lovely letter she received from an unknown admirer about her stories. J&P: Sir, we can see how encouraging you are of all that she does. So was yours a love marriage? He: No, it was an arranged marriage. But we knew each other from childhood. You must understand that ours is a very small and close knit community. Our parents were friends and that is how we knew each other well. We were married in 1965. J&P: Was your family prepared for a working woman as a daughter-in-law? She: Of course. In fact, all the women in his household used to work except my mother-in-law. We stayed in a joint family for twenty-five years. He: My mother was a very encouraging person. I lost my father at the age of ten, but my mother managed very efficiently and never allowed us to worry. J&P: That is indeed admirable. Tell us, what you liked in each other when you were married. He (smiles indulgently): One never thought of these things. We just got along naturally. She: To tell you the truth, I never really thought about marriage. I was more interested in all the things I wanted to do. She: Life was always busy – housework, office work, and then my hobbies and going to rehearsals. In the midst of it all, I also took some time to learnt Japanese craft, attended some cooking classes and did a nursing course. He: In fact, she has helped many women and empowered them economically. J&P: Who inspired you to pursue your interests? She: My parents, especially my father, encouraged me a lot. He was employed as the treasurer in RBI. As I was attached to the welfare office, I taught employees’ wives simple things like stitching the borders of cloth napkins, which they would pack neatly and supply to the offices of Air India. This helped them earn some money. Before retiring, I also set up a system for them to make and supply chapatis to office canteens. He: She has also done voluntary work with SOSWA (Society for Service to Voluntary Agencies). She: Yes, that was good work. They train volunteers to work in NGOs and schools for underprivileged and handicapped children. J&P: Do you share responsibilities in housework? He: Yes, of course, I always wake up at 6 am, boil the milk and prepare the tea decoction. I don’t cook but I help in keeping the house clean. J&P: Spotless and beautiful, you live in a lovely house. What makes you so broad-minded? He: My job allowed me to meet people from different walks of life. This always helps to broaden one’s outlook. If a man wants a woman to work outside the house, then all the more reason that he should help in the housework. She: When we visited my brother who lives overseas, the deal was that if we women did the cooking, the men did the cleaning. J&P: What would be your advice to youngsters about marriage and commitment? She: The first criterion is understanding. Make an effort to understand the other, and never try to dominate. He: There should be equality, by this I mean that one must not compare. Is he more educated than me, is she earning more than me? One should not to think along these lines. She: Married couples should pool in their finances in the running of their homes & lives. It should not matter whose earning it is. J&P: Thank you for bringing this point to focus. You are right – the notion of ‘me’ and ‘mine’ needs to be changed to ‘ours’. In that sense, life was surely simpler and humbler earlier. She: When we married, all of us at home managed both office work and housework, and managed the kitchen quite easily as well. J&P: Do you think times have changed with regard to cooking at home? What are your favourite foods? She: At home, we prefer Maharashtrian food, but he is not at all fussy. He: I have no preferences really. She enjoys cooking and prepares delicious food. In fact, talking of changing times, I believe that the prevalence of fast foods has reduced the younger generation’s interest in cooking. Both of us also enjoy eating out occasionally. And I must tell you about how she used to prepare chapatis for the entire family when we were married; she did it untiringly and perfectly. In fact, I think you must feature the ‘khakra’ recipe made in our homes – a childhood favourite for all of us. First published in July 2012 in Harmony – the Indian Magazine for elderly for the column – Soul Food and Soul Mates. Part-2 of this post is the traditional recipe of Maharasthrian Khakra from the kitchen of Ina & Bholanath Talpade – the 12th couple featured in this column.